I am pleased to share with you today the news that Ron Wilks will be promoted to Vice President of Enrollment Management. Ron will begin his new role July 1, 2018. As you know, Mark Weigand has announced his retirement after almost 40 years of service to UIndy. One of Mark’s best gifts to UIndy is that he developed a staff that is recognized as experts across the United States. As I thought about how to go about finding the talent to continue the work that Mark did, I realized that we had access to someone in our own back yard. Rather than engaging in a national search, I decided the best course of action was to create a vetting process for Ron. This process included meetings with the Cabinet, members of the University’s Board of Trustees, and other leaders around campus. The outcome of these discussions was the unanimous support for Ron’s promotion to this critical role. Beyond the gift of continuity that Ron’s promotion affords us, I am also impressed with his place in the national conversation about enrollment and retention. Ron is an often sought after contributor to national conversations on the trends and challenges facing private universities. While we are familiar with Ron’s portfolio of successes here, he is also recognized across the nation as an expert in admissions and enrollment management strategies having been recognized by the Indiana National Association for College Admissions Counseling (serving as president in 2005) and its National Organization (NACAC). 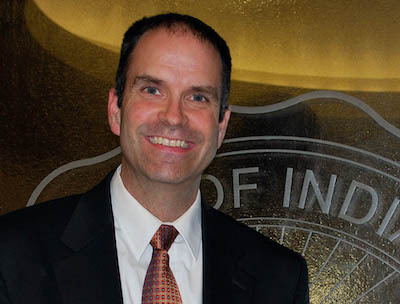 His work has also been acknowledged with several awards including the 2008 Indiana Association for College Admissions Counseling Distinguished Service Award, and he sits on the national advisory board for EMIS – our inquiry management software system. Please join me in congratulating Ron on his new, and well-deserved role at the University.